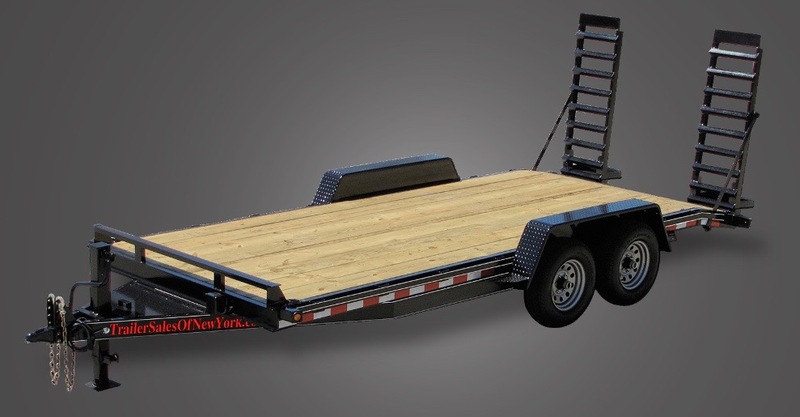 Trailer Sales of New York - Trailers for Sale! Trailer Sales of New York – Low Price, High Quality – Small Overhead, Big Savings! 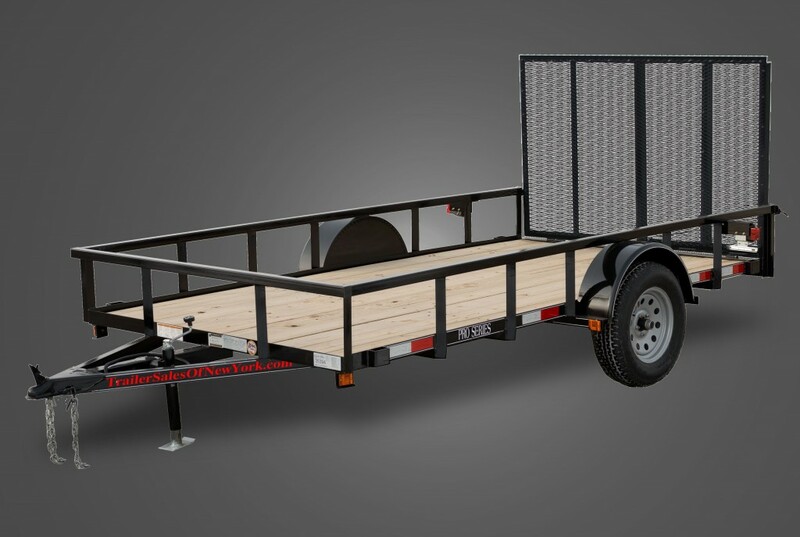 Utility Trailers – Trailer Sales of New York offers landscape utility trailers with angle iron frames in both angle iron and tubing top rails, full landscape gate, and channel iron tongues. We offer single and tandem axle utility trailers in GVW ratings up to 12,000 lb. These models are equipped with great features. 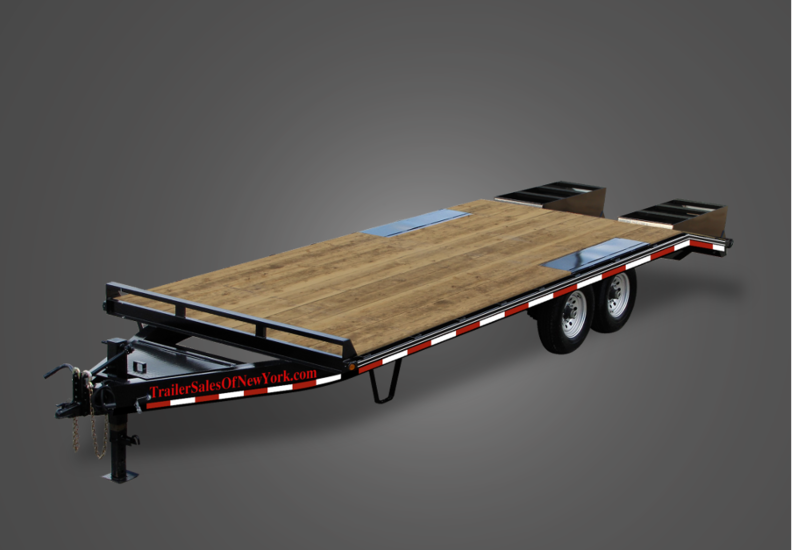 Gooseneck Trailers – Trailer Sales of New York sells gooseneck trailers in both single and dual wheel models. The flatbed trailer lineup has the floor over the tires. We also offer an equipment style gooseneck with fenders and the floor between the tires. These models have heavy gauge diamond plate fenders and swing up channel ramps. 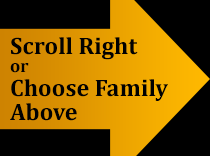 All models have either a rugged I-beam or channel iron main frame. Equipment Trailers – Equipment trailers by Trailer Sales of New York are built with all channel frames. Our trailers have the traditional “wrap-a-round” tongue that goes under the main frame and extends back to the axles. 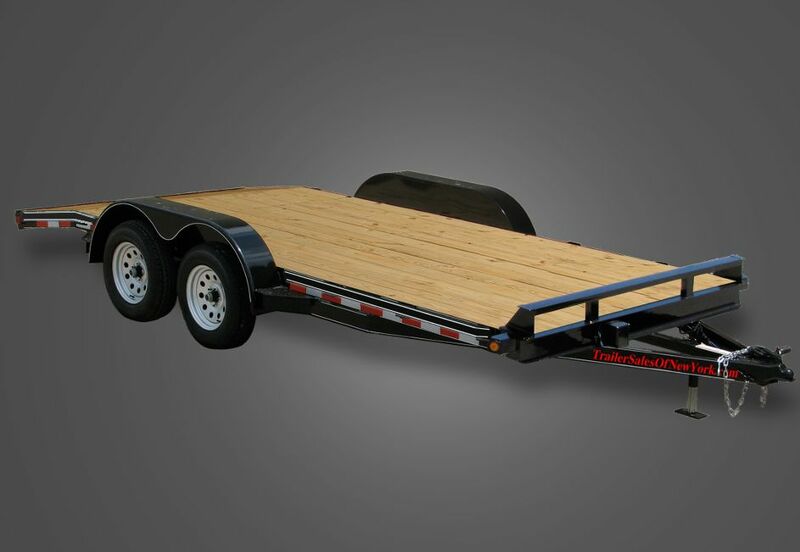 All equipment trailer models feature heavy gauge diamond plate fenders and swing up channel ramps. This line is available in GVW ratings from 8,000 to 15,000 lbs. 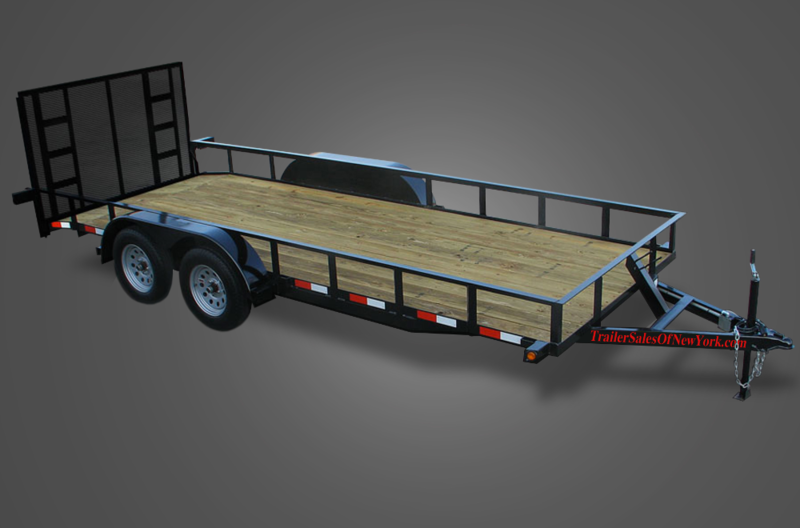 Car Trailers – Trailer Sales of New York offers car trailers with either channel iron or rectangular tubing frames. These models are available in both wood and diamond floor versions. The loading ramps slide in under the floor for easy storage. We also offer a hydraulic tilt car trailer that does not require loading ramps. 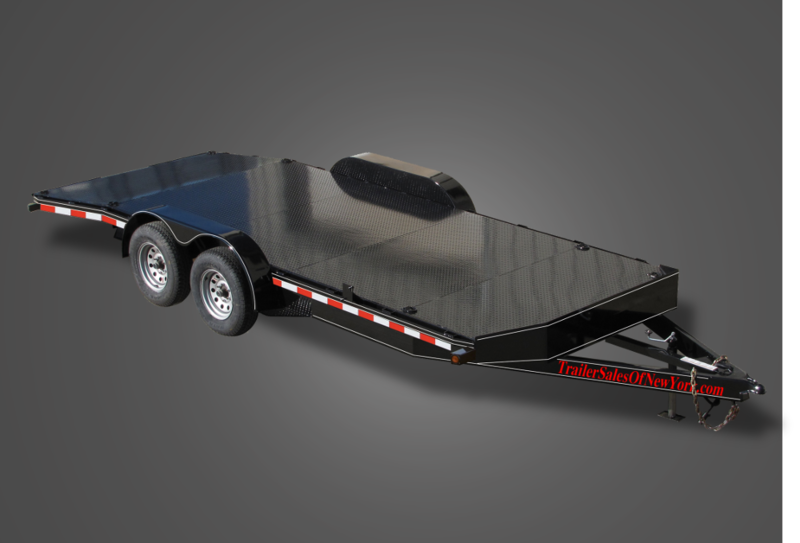 The wood floor car trailers feature teardrop fenders, swing up jack, and stake pockets. The diamond floor models also have these same features as well as d-ring tie-downs. Our wide variety of car trailers are available to you at competitive prices. Check out our full line before you buy! 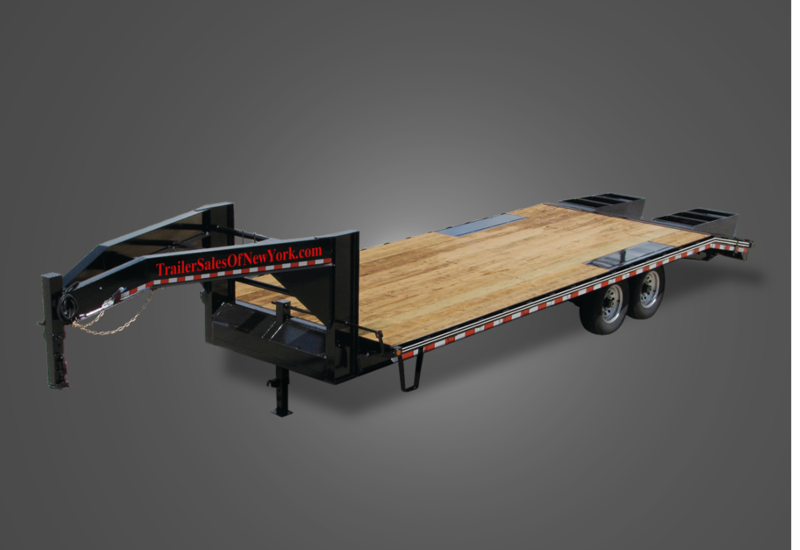 Flatbed Trailers – Trailer Sales of New York flatbed trailers are available with either gooseneck hitch or bumper pull (pintle) hitch. 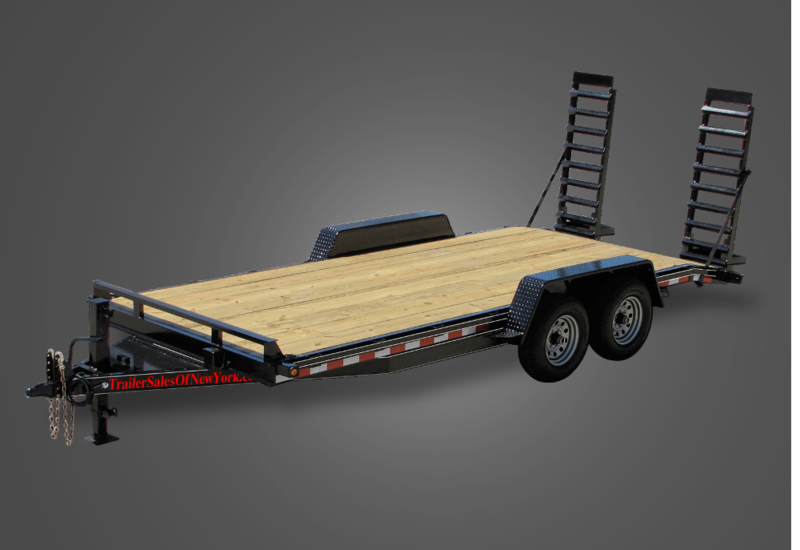 Our gooseneck flatbed trailers are displayed under the “Gooseneck Trailers” button. Our pintle hitch flatbed trailers have the floor over the tires with stake pockets and an outer rub rail – the full length of the bed. These models come standard with wedge shaped lay-flat ramps that make the floor flat for the full length of the bed. Both our gooseneck flatbed trailer and pintle-pull flatbed trailer lines are constructed with rugged I-beam frames. Call Today or Visit our Trailer Sales of New York for the Best Trailer Deal Around!